In some amphibians, red eyes aren't a sign of lack of sleep, but rather are just the way they naturally look -- specifically, red-eyed tree frogs (Agalychnis callidryas). These carnivorous creatures possess striking bright red eyes and a serious knack for jumping. Red-eyed tree frogs are also sometimes referred to by the names "monkey frogs" or "red-eyed leaf frogs." The protruding scarlet peepers aren't the only physical characteristic of the red-eyed tree frog. In terms of size, the rather slight frogs usually range from small to moderate, with an average weight of between 6 and 15 grams, according to the website for the Philadelphia Zoo. The body length of female red-eyed tree frogs slightly exceeds that of the males. The female range is between 64mm and 76 millimeters, while the male range is between 51 millimeters and 64 millimeters. Both deep and pale green coloration exists in the frog species. Some red-eyed tree frogs also feature pale-colored patches. The frogs' throats and stomachs are always white. Free roaming and wild red-eyed tree frogs typically survive for about 5 years or so, according to the website for National Geographic magazine. The diet of the red-eyed tree frog is totally carnivorous -- the same as with other frogs. Bugs make up a lot of the frogs' diets. Some common meal staples for the predominantly arboreal frog species are crickets, grasshoppers, moths and flies. In some cases, the red-eyed creatures also chow down on fellow frogs, albeit smaller varieties. For wee tadpoles, pinhead crickets and fruit flies also make a common meal. Feeding typically takes place during the night hours. The frog species often resides in lowland rainforest regions, particularly those close to rivers, streams, brooks and ponds. 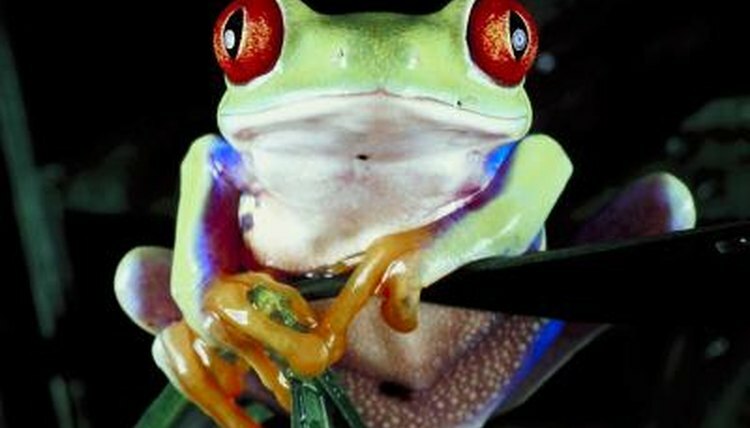 Red-eyed tree frogs are prevalent in a variety of different areas, including northern portions of South America, Central America and even southern regions of Mexico. Some of the biggest predators to the red-eyed tree frog species are alligators, tarantulas, owls, snakes, birds and bats. The frogs' lithe and lengthy legs often help them to quickly jump away from the risks of predators. The red-eyed tree frog's eyes are red for purposes of startle coloration. When the frogs feel threatened by the presence of predators, they can open their bright red eyes up widely in order to use them to their greatest advantage -- for distracting their opponents and hopefully scaring them away. The eyes are a striking red color as a form of defense mechanism. If the unexpected eyes disorient and confuse any predators, it buys the frogs precious time to get out of hazardous circumstances.